Friday - Commander Editor-in-Chief Mike Andrews, The Dude, threw down his trump card and listed his rankings, which also happen to be the SoxProspects.com site rankings. Friday - The aggregate ranking of the lists submitted by the five members of the brass, as well as the results of the SoxProspects.com forum members voting. Mike Andrews went into more detail on the SoxProspects.com top 10 prospects for ESPN Boston this week, with scouting reports for each player. Our information on the top 40 is only just beginning. Beginning Monday we will be starting our annual Top 40 Season in Review series, where we go through each player in the top 40 rankings and recap their 2013 season. We are not the only outlet who is publishing rankings, Baseball America has been coming out with their Top 20 for each league. Red Sox made up one quarter of their Carolina League Top 20: Henry Owens (4), Blake Swihart (5), Garin Cecchini (6), Mookie Betts (7), and Deven Marrero (13). The Red Sox were also well-represented in the New York-Penn League Top 20 from Baseball America, with Manuel Margot (7), Simon Mercedes (10), and Jamie Callahan (15) all making the list. Finally, in their South Atlantic League Top 20, Mookie Betts (8) was the Red Sox lone representative and in the Golf Coast League Top 20 Wendell Rijo (9) was the only Red Sox to make the list. Check out their articles for detailed reports on every player in their respective top 20 list, and more lists will be released in the coming weeks. Not to be outdone, John Sickels of SB Nation's Minor League Ball came out with his end of season top 75 rankings. 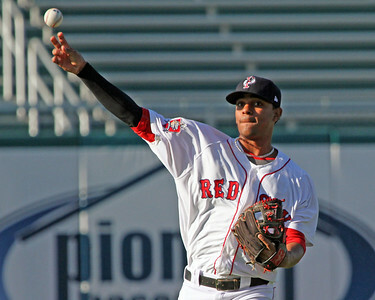 Unsurprisingly, shortstop Xander Bogaerts was the highest of the five players in the top 75. He was ranked second overall, only finishing behind the Twins outfielder Byron Buxton. The Red Sox also had three players listed in his "honorable mentions" section. Last Sunday the SoxProspects.com staff got together to celebrate the 10-year birthday of the site. Executive Editor Chris Hatfield has a nice tan going from his time at Fall Instructs down in Fort Myers. He wrote today about what he saw during his time down there. This time of year is not the peak of signing season, but nonetheless the Red Sox signed left-handed pitcher Nate Reed to a minor league contract this week. First baseman Jose Abreu (pictured), who recently defected from Cuba, went through a workout with the Red Sox this week as reported by Sean McAdam of Comcast Sportsnet. Many believe big bodied slugger would need very limited time in the minors, if any, before being able to help a major league team. There are many teams rumored to be in the hunt for the Cuban star, and with Mike Napoli a pending free agent, the Red Sox will certainly consider him. Former PawSox manager and current Red Sox bench coach Torey Lovullo could draw interest from MLB teams in pursuit of a new manager this season as Evan Drellich of MassLive.com reports. Third-base coach Brian Butterfield will likely be a candidate for some of the managerial openings as well. With the major league team back in the playoffs some prospects have a chance to have an impact on the hunt for another World Series. WEEI.com's Alex Speier writes that playoff pressure is not foreign to Brandon Workman. Photo Credit: Xander Bogaerts by Kelly O'Conner and Jose Abreu by Koji Watanabe/Getty Images AsiaPac.